Preparing to brew the Bavarian Hefeweizen on Saturday. Will be using WY 3068. Aggressive yeast which needs more head space than most other ale yeasts. 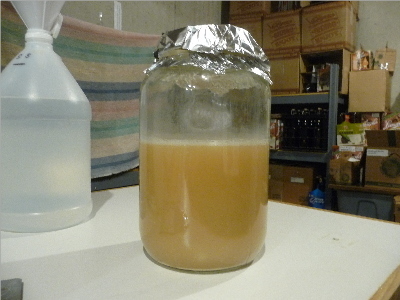 Using a 2 liter flask would require a three step process and still exceed the inoculation rate in step 2 and 3 for optimum yeast growth. Decided to go with the shaken not stirred method in my big mason jar except I forgot it was smashed last year. Used a gallon pickle jar. Not the ideal 4:1 ratio of volume to wort. The krausen rose to the foil this morning when I swirled the jar. Thought I would get blow off and need to start transferring some of the starter to 2 liter flasks. Just got lucky on this one. Anything glass and sanitized with foil seems to work. I've been using a wine carafe for small starters.